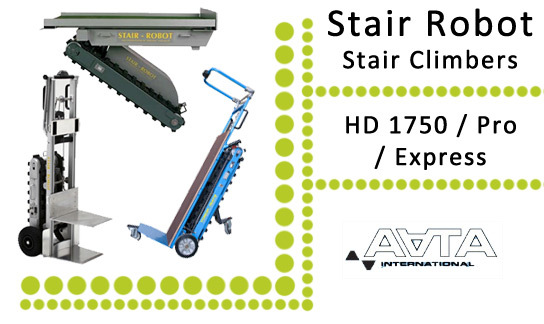 The stair- robot professional is equipped with a folding swivel wheel for turning in tight spaces and easy operation. Goods up to 1880 mm can be handled with ease due to the telescopic structure and an optional remote control can make working with longer items even easier. The driving force is supplied by a low noise 24V permanent magnet motor and is transmitted directly to the drive shaft by a gearbox. The PM-motor provides an effective braking system when the trigger is released or the power supply is interrupted for any reason. 4 batteries are placed in series with a 24 volt output. An integrated LED battery indicator on the display makes it possible to easily monitor the battery level.